A two-time CES exhibitor, LifeFuels premiered its portable drink maker at CES 2016 and then initiated its strategic partnership with Keurig Dr Pepper based on LifeFuels’ exhibit at CES 2018. LifeFuels, the creator of the world’s first portable drink maker, has benchmarked its growth through three years of participating at CES. Starting with its product launch in 2016 and continuing through its discovery by and subsequent strategic partnership with Keurig Dr Pepper at CES 2018, LifeFuels sees CES as one of its most important business events. With an aim of 100 percent hydration, the LifeFuels smart water bottle and smart FuelPods dispense all-natural flavored and functional concentrates to the desired strength and taste, and they work with an app to recommend hydration and track consumption. Because the smart water bottle integrates with fitness trackers, LifeFuels can help consumers get a more holistic view of their health. 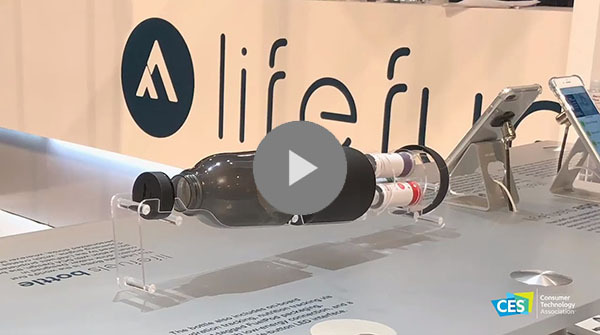 Crossing the beverage technology, sports, health and lifestyle product categories, LifeFuels doesn’t neatly fit into the mold of other industry tradeshows. I've been to a lot of tradeshows over the course of my career, but I've never experienced anything that was as successful and as productive as the two times we've exhibited at CES. At its first CES in 2016, startup LifeFuels pitched its water bottle at Eureka Park and set out to validate the concept of its products and meet potential partners. LifeFuels found its industrial design partner, DCA, that year and received accolades that attested to the products’ potential: LifeFuels was an Innovation Award honoree and was named a “Best of CES” Finalist by Engadget at CES 2016. During CES 2017, the LifeFuels team didn’t exhibit but attended to meet with representatives from other companies in attendance to share their redesigned bottle and to maintain interest in partnering. LifeFuels was discovered by Keurig Dr Pepper at its exhibit space at CES 2018. For CES 2018, LifeFuels was back on the CES show floor with a team of 15 and space in the Sands Expo Center. They set up a display of 12 bottles and sought out a strategic partner. Another Innovation Award honoree win helped set them apart from other exhibitors and increased their visibility. Most important, they drew the attention of Keurig Dr Pepper, who discovered LifeFuels on the show floor. The companies have since formed a strategic relationship, and Keurig Dr Pepper has invested in LifeFuels. “CES 2018 was a game changer for LifeFuels,” Perrelli says. In both of its exhibiting years, LifeFuels also participated in CES Unveiled events to garner media interest before CES. LifeFuels received a patent on its smart bottle technology in 2018, and Perrelli and his team will be attending CES again in 2019 to meet with distribution, retail and industry partners. Want to Exhibit at CES? Showcase your brand, launch your latest products and win business at the ultimate platform for innovation.